In April, Harvard University Press will release my The Mormon Jesus: A Biography. 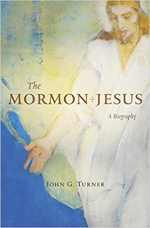 In this book, I use scripture, ritual, artwork, and many other sources to analyze the many ways that Latter-day Saints have imagined, described, and experienced Jesus Christ over the past two centuries. I present the Latter-day Saint savior as both utterly Christian and distinctively Mormon. Research and writing are worthwhile for their own sake, but it’s also incredibly rewarding to spend time with readers and other interested parties. I love visiting campuses, bookstores, and churches to discuss with others the subjects I’ve been fortunate enough to study. If you are interested in such an event, please contact me [jgturner52 (at) gmail.com] or my publicist with Harvard [Lisa LaPoint, lisa_lapoint (at) harvard.edu]. This entry was posted in Events and tagged mormon jesus, new book. Bookmark the permalink.